Nanowasp has been tested on Windows XP and Windows Vista, using accounts with admin privileges. It probably won't work under normal user accounts with the default installation options because it writes to disk images which it expects to be under the installation directory. However, it should run under a normal user account OK if a different installation path is chosen (the installer will still require admin privileges because it needs to install some DLLs). It may run on Windows 9x but this hasn't been tested. Additionally, it should be possible to compile Nanowasp for Mac OS X and Linux without too much difficultly (no binaries are provided here for these platforms). The emulator uses OpenGL for its graphics routines. The operations are all simple bitmap operations, so the standard software implementation of OpenGL that comes with Windows should work fine. A graphics card with OpenGL support will obviously improve performance. Nanowasp hasn't been heavily optimised for speed, but any reasonably recent machine should run the emulator at full speed without any problems. As a reference, the development machine has an Intel Core 2 Duo 6420 running at 2.13GHz and the emulator uses approximately 10% of the CPU (i.e. around 20% of one core). These downloads are provided primarily under the terms of the GNU General Public License Version 3. Some portions originate from other projects and have their own licenses. Basically this means that you can download and use the binaries and source yourself freely, but certain restrictions are placed on modification and redistribution, and there is no warranty of any kind. See the license texts for full details. 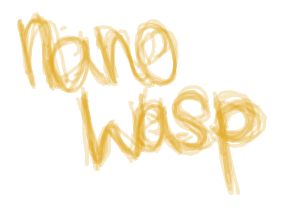 Note: Nanowasp is equivalent to just the Microbee hardware, and requires actual Microbee software to be of any use. A good archive of Microbee software is The Bee Board (a community of Microbee users). Please see the documentation for a guide to getting up and running.